Red potatoes are tossed with hard-boiled eggs and savory Jones pork sausage in this hearty twist on a summertime staple. Place potatoes in large pot and cover with at least 1-inch water. Bring to boil and cook until potatoes are fork tender, about 20 minutes. Drain and return to same pot and let sit until cool enough to handle. Meanwhile, in large bowl, combine mayonnaise, sour cream, balsamic vinegar, mustard, onion, salt and pepper. 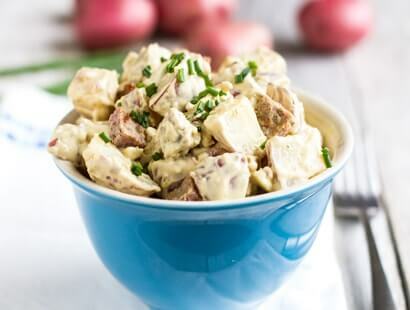 Cut potatoes into bite-sized pieces and add to bowl with dressing. Gently toss to combine. 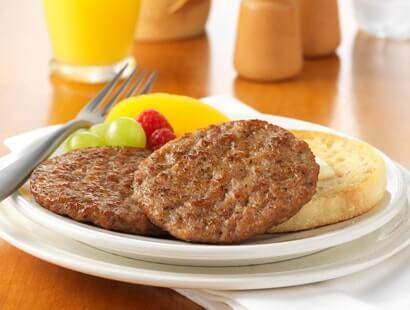 Stir in eggs and sausage. Refrigerate at least 2 hours prior to serving. Serve topped with chopped chives.